We’re excited to announce that BV Chicago will be returning to SXSW this year! 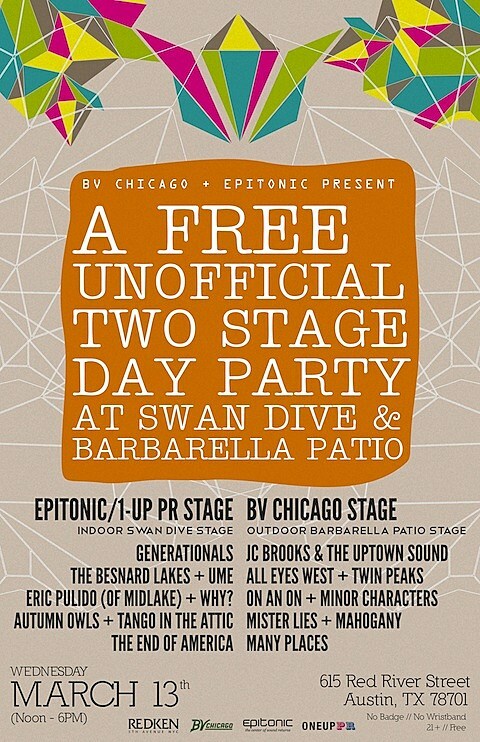 We have teamed up with Epitonic to bring you a FREE unofficial two stage day party at Swan Dive and Barbarella Patio (615 Red River Street) on Wednesday, March 13 from noon – 6PM. The outdoor Barbarella Patio stage will feature Chicago-based acts, while the indoor Swan Dive stage boasts an international lineup. JC Brooks & the Uptown Sound will headline the Barbarella Patio stage, along with support from All Eyes West, Twin Peaks, On An On, Minor Characters, Mister Lies, Mahogany, and Many Places. Attendees will be able to move freely between the patio and Swan Dive, which will house Generationals, The Besnard Lakes, Ume, Eric Pulido (of Midlake), WHY?, Autumn Owls, Tango in the Attic, and The End of America throughout the day. Admission to Swan Dive // Barbarella Patio is 100% FREE and no badges/wristbands are required. There IS a 21+ age restriction though, sorry about that! Thanks to our sponsors Redken for making this party possible. They’ll be giving out free samples of their products throughout the day. More free stuff is TBA. And stay tuned for the announcement of BrooklynVegan‘s day parties and showcases!